Jump over to our Storage FAQs page for some guidance on how to pack and prepare for storing. Need supplies to make your move a breeze? We sell everything you need! Still not finding what you are looking for? Send us a message or give us a call and we will be happy to assist. 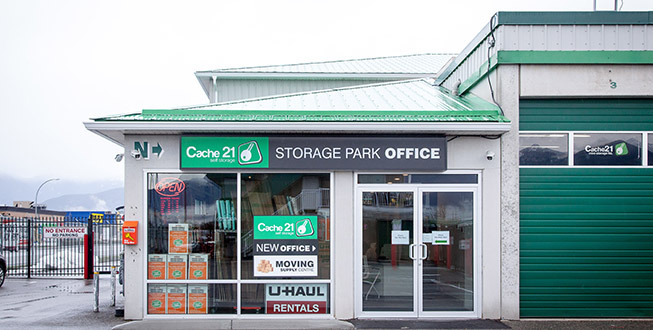 Founded in 1978, Cache 21 Mini Storage is the original self-storage facility in Chilliwack, BC. We are an impeccably clean storage unit facility with best-in-class self-storage solutions located conveniently just off the Highway #1. We are committed to serving both our residential and commercial customers with a full suite of customer-focused amenities including heated units, drive-up access, automated gates, 24/7 HD infrared security cameras and a spacious 84,000 square-foot facility. As a local business, we are dedicated to serving our customers, to our employees and our neighbours in the community while staying focused on creating value for our customers. We offer personalized, knowledgeable customer service. Our staff is happy to provide assistance in each step of the storage process, from choosing a unit size through to the details of your moving day. We are also an authorized agent for U-HAUL and can supply truck and trailer rentals as well as having an extensive inventory for moving supplies, the largest and most stocked in the area. We can be your one stop for all storage and moving needs, and our friendly reliable attention to detail is what keeps our customer coming back and referring their friends and family to us.